The Charnwood Dunlop School site is comprised of three buildings and a sports hall. The main school building houses the school administration and all classes from K-6. Our new library, which is also in the main building, has quickly become one of the main hubs of the school, where students use their break time to read books, use iPads and play games. The newest building houses ,the Belconnen Primary Introductory English Centre, as well as the 'Pilbrow Room', a large multi-purpose room used for activities including school band rehearsals, junior school assemblies and meetings. Our preschool is located in a purpose built and separately fenced area. It has recently experienced an upgrade to its outdoor spaces. The school hall is used for sports, concerts and other events such as graduations. This is also where After School Care operates every afternoon. Our school grounds are spacious providing a large oval for students to play on during break times, a basketball court and a fully covered play ground. 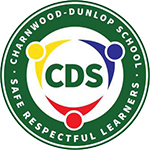 Charnwood-Dunlop School has three car parks around the site. The first off Bettington Ct, the second off Cartwright St near our school hall and the third a smaller area next to our preschool off Grono Pl.